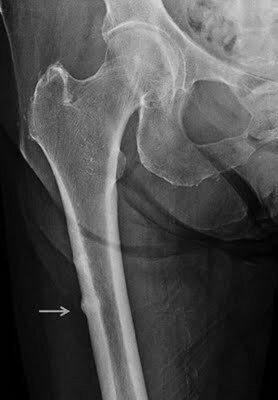 The FDA and the American Society of Bone and Mineral Research Subtrochanteric Femoral Fracture Task Force (read about the task force here) are convening to investigate this topic. At present these types of fractures are extremely rare and all fractures of this type are under investigation by medical specialists in this field. When considering drug therapies for bone health, one must consider the risks and benefits. When we know that the risk for someone breaking a bone due to osteoporosis past the age of 50 is 1 out of every 2, sometimes the risks of these rare types of fracture is worth it. I am not advocating the use of drugs, I am just stating that this should be a conversation and a mutual decision by patient and physician. On a side note, it is currently recommended that patients take a “drug holiday” occasionally when on a bisphosphonate type of drug. We will keep looking at the research as it comes forward to make informed decisions. So, for now, let’s keep exercising, practicing balance, working on leg strength and spinal extensor strength to aid in fracture prevention and overall health and function! I have been on Boniva approx. 5 years or less. My doctor insists that I stay on it. I heard that it causes glacoma of which I have. I discussed this with my doctor and he has not found evidence of Boniva causing this. I have also done a little research and it was inconclusive. What do you think? Should I continue with this drug? I also know that my sister-in-law had problems with fosamax affecting her jaw bone. So far I have had no problems since I have been on this drug. Just wondering and wanted your opinion. I don’t know of any relationship to bisphosphonates (Boniva, Fosamax, Actonel, etc) to glaucoma. However, it may be time to take a drug “holiday”. If you experience mid-thigh pain you should definitely report this symptom to your doctor. I would discuss this with your doctor and share the latest information on Subtrochanteric Fractures with her/him. The good news is osteonecrosis of the jaw and subtrochanteric fractures are very rare. Best of luck to you…and remember to keep exercising, practice good postural alignment and balance no matter what drug you decide to take!